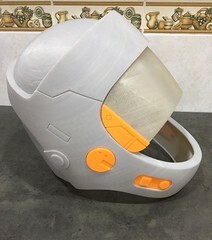 Thought I would add yet another helmet to finish some day. 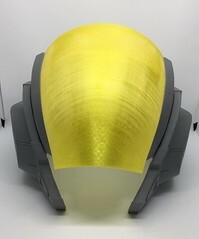 SW Rebels A wing helmet. 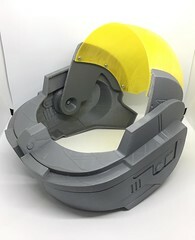 The visor assembly moves up and down. The head they animated is extremely long and narrow, translating that to a real human head lead to a few differences in the shape and placement of some surface features, But other than that looks pretty good. Compliments my other Rebels A/Y Wing. This has some accuracy issues that I will fix while post processing. Dang, those are looking awesome! 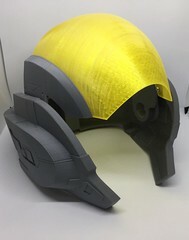 Are you going to replace the visors with something more transparent or are you going to keep them looking more opaque as they are now? I will replace the visors with mirrored see through ones. Use the modeled ones as templates. 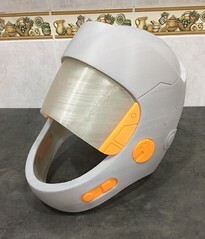 The A/Y wing helmet needs to adjustments as the chin piece is too narrow and the brow part is not quite right. Well, they're definitely looking nice.